The first thing to do when planning your move to college is to check in with your school. Look for the housing or residency department, who manage the dorms. They might have a packing list that suggests items for you to bring. You should start packing for college well in advance of your actual move-in date. Throwing things in your bag at the last second won’t cut it for this trip. You can find a very long list at CollegePackingList.com. You definitely won’t need everything that list suggests, but it’s a good place to start. Always check with your parents or guardian before deciding which personal identification cards to bring with you and which your parents want to keep at home. Losing a social security card is a major hassle, and most students change dorm rooms (and move their stuff) every single school year—things can get misplaced in the shuffle. It’s always a good idea to contact the school as well to see what type of identification they require. For example, out of state students at the University of Arizona must present a form of ID other than a driver’s license. Most schools have first-year students show up a few days before returning students, so you’re very likely surrounded by people just as eager to make friends and dive into “being in college” as you are. Don’t be afraid to start conversations! Definitely visit campus before the first day of class. You may have visited your new school before you decided to apply, but you had a different set of goals then and you were seeing things with different eyes. Where can you park? Where do the buses run? Where are your classes, and the mailroom, and the best pizza place? These are all important landmarks. If you haven’t already been issued a student ID card, you need to get one as soon as possible. You will use this card for a lot of things on campus. Some schools provide them at orientation, others leave it to you to obtain one. Contact the school and find out how, where, and when to get your student ID card. Not bringing a car to campus? Most students don’t. There are lots of ways to get around easily. Some colleges provide shuttles to and from campus, and even from one part of campus to another. Ask about this in the student union, or at your dorm. Make sure you grab a map of the routes and times for pick up and drop off. Having a bike is also a great way to stay mobile. Most campuses strongly encourage students to ride a bike rather than a car to campus, and provide bike parking outside many buildings. Just be sure to lock your bike up when you’re not using it. We recommend a U-lock, not a thin chain lock, which can be cut (college campuses are not immune to theft). Duh, right? This sounds obvious. But there are always people who don’t do it. If you don’t go to class, you’ll start to fail classes, which is a very expensive waste of your time. It’s easy to get distracted by some of the non-academic things around you—dating, parties, friends, freedom—and that stuff can be an important part of your experience at college. Alternately, sometimes students find the new freedom they have at college, and the corresponding responsibility, to be overwhelming. If you’re stressed or depressed, there’s help available: check out your school’s study or tutoring center. Student health centers can also help you find someone to talk to about how you’re feeling. It’s OK to miss a class once in a while, of course. Everyone gets sick sometimes. You don’t have to fall behind as a result, though: get some classmates’ phone numbers on the first day. Professors often leave it up to you to get the notes from someone for a class you missed. One of the biggest differences between high school and college is that in college, you won’t be reminded of your responsibilities. Each professor will give you a syllabus, which is a complete guide to the class, including assignments. They will expect you to know when tests are coming up, when essays are due, and when you should be finishing chapter 12. Some teachers are stricter about this than others, but nobody will hold your hand or or give you back points on a late paper because you forgot when it was due. Keeping a calendar and a to-do list can be a major help in staying organized. Do you check your email every day? If not, college is the time to start. Lots of professors send email with instructions about assignments, changes to class schedules or locations, and other important information. Similarly, don’t wait until the last minute to check your school email account, either. Professors often assign readings prior to the first day of class. They may have sent you an email about it. Bring your books for the first day of class. You should be ready to dive into coursework right from the start. Bring stuff that will let you take notes effectively. For some people, that’s a spiral notebook (one for each class, to keep things straight), pens and highlighters. For others, it’s a laptop computer—although not all teachers allow laptops in their classes. Either way, bring folders so that you can store any handouts. If you think you might stop by a computer lab while you’re on campus, bring a flash drive. Also make sure you’ve got a couple of dollars, in case you get hungry or thirsty. Finally, Don’t forget to bring your room key (if you’re living on campus) and your student ID. Don’t want to be the person trying to sneak silently into the back of the class after the bell? Leave earlier than you think you need to, especially the first week or two. If you walk, it might not be as close as you thought; if you drive, you might have trouble finding parking. Make a good first impression by showing up prepared and on time. When you get to campus you will see many banks and other organizations offering credit cards to students. Think twice before you decide to apply for one. Credit cards can get you into major money problems—we’re talking up thousands of dollars in debt. Racking up charges that you can’t pay back is also a good way to ruin your credit for years to come. Imagine applying for a loan on a car years in the future and finding out that you’ll have to pay more money because you didn’t manage your money right when you were in college! An interest rate determines how much you have to pay if you don’t pay off your card in full each month. They’re also called “annual percentage rates,” or APR. High interest rates can quickly increase the amount you owe, so this is one of the most important things to find out about. As a student without a credit history, you might not be able to get a good interest rate. As a general rule, a 20% interest rate is high, and a 14% rate is about average. If a card has an interest rate much higher than 20%, run away screaming. They’re trying to take advantage of you. Some credit cards charge monthly or yearly fees just to have the card. Others charge fees on top of the interest rate for balances that you don’t pay off on time. Most cards charge very high fees and interest rates if you withdraw cash on your credit card (using it like a debit card). Make sure you understand these fees and are able to pay them, or better yet, avoid paying them! How much credit do I have? Every credit card account has a “credit limit,” which is exactly what it sounds like: the maximum amount you can have on the card at any one time. Your first impulse might be to look for a card with a high credit limit, so that you’re not in danger of running out of credit. That’s not always the right move, though. Until you get used paying off your balance and managing your expenses, you should look for a card with a reasonable limit—less than $1000 is a good place to start. Credit card companies are often willing to raise the limit when you ask, especially if you’re a good customer, so there’s always room to grow later on. Have you ever planned out a budget for yourself before? If not, you might try asking your parents or guardian for help. They’ve got years of experience balancing a budget, and they’ll probably be delighted that you’re being so responsible. You’re responsible for your own expenses now, and you can’t afford to just assume everything will balance out. Make sure you budget the fun stuff. You’ll be meeting awesome new people, maybe even exploring a brand new city (or even country). You’ll get a lot of invitations to go out and do things. Going out costs money! Plan on spending cash for dinners, movies, or whatever it is that you like to do. If you’re consistently over budget, you might need to reevaluate your regular expenses, or else skip the fun once in a while. You social butterfly, you. You many even need to find a job for some extra income. Lots of students do. Start by checking with your school to see what posistions are available on campus. On-campus employers are usually convenient, and understanding of your class schedule. A part-time job is a good place to start, to make sure you can fully balance your class load with your work load. College is a good time for you to start saving money. This rule applies to everyone, but especially those who opted to take out a loan. After graduation, you’ll need to start paying that loan back—and you might also have to pay for a move and a new apartment. You don’t have to eat ramen noodles twice a day, but try to get in the habit of slowly and consistently putting away some of every paycheck in a separate savings account. If you’re going to school close to where you lived with your parents or guardian, consider living with them for a while longer. Sounds thrilling, right? But you can really do yourself a favor by staying at home. (And your family loves you! Probably.) Life after high school is expensive. If you just can’t stand the thought of being at home a minute longer, finding a trusted roommate or roommates can also help keep your costs down. Ideally, study blocks are usually set at 50 minutes, although some material may be more difficult to get through, so adjust that time as needed. Once you set your time-block, however, stick to it! It would be helpful to set your alarm, so that you aren’t glancing at the clock or phone every few minutes. Keep breaks short, about ten minutes or under. Use your break time to have a snack, stretch, or catch up on replying to your emails and text messages. Find a space that is free from distractions that helps you focus. If you have a study space in your home, make sure that it’s well-stocked with pencils, pens, paper, and other study items so that you won’t have to hunt those items down every time you settle in to study. If your ideal study space is in a public area, like the school library, it might be helpful to stock all of the study items you need in a bag that you can easily bring with you. This way, you can focus on doing one chunk of homework or task each time you sit down to be productive. This makes the activity less intimidating, and it would be less difficult for you to actually get started. Plus, every time you complete one chunk, you would have completed one small goal. Reward yourself with a well-deserved break. You will be more productive, and end up finishing more, if you do the hard stuff with deadlines first! Often, if you focus on the easiest tasks first, you become too tired to tackle the tough material in an effective manner. Thus, it makes more sense to do the tough tasks while you’re feeling fresh and energized, and push through the small things when you’re a bit more tired. It might be a good idea to mute your cell phone or sign out of your email/social media accounts during the time you’re studying. That way you don’t have to turn your focus away from studies to check them. We all know how hard it is to turn it back on right after doing things we’d prefer to do! Document your tasks with a daily To-Do List and a Planner. Besides helping you prioritize assignments and tasks by importance and deadlines, these activities of writing down things you need to do prevent you from forgetting to do them! It’s useful to keep a small To-Do List (don’t put too many items on the list—it would feel too intimidating and you won’t feel as accomplished), a weekly planner (so you can see upcoming deadlines), and a long-term planner where you can list important project deadlines and exam dates. It’s important to understand how long it usually takes you to do various activities, and how much time you can work before you’re too tired to complete tasks effectively. With this knowledge you can plan on which tasks to devote more or less time to. For example, one person may be a fast reader, and thus can devote less time to reading the same material than someone who reads slightly slower. That same person may find it more difficult to finish math problems, and thus spends more time on them. Knowing your abilities helps you to plan your daily tasks accordingly. It’s important to know how long each task usually takes you, and to plan and allow enough time to do them. Don’t forget your health while getting things done! Eat healthy (limit your intake of cheeseburgers and pizzas, eat veggies and fruits), and exercise (it helps a lot with stress, and increases productivity)! Tight deadlines can be very stressful. If you’ve been working on a project or studying for a test, you must be motivated and organized to complete your goal. Click on this link for an infographic from www.mbaonline.com for tips and study ideas that will help you with your toughest deadline. Although college is so much more, the academics aspect of college is very important. After all, in the end you’re going to college to learn and earn a degree. Here are some websites that provide a wealth of tips and hints on how to excel on coursework and exams. College students are usually on-the-go, juggling many things such as studying, classes, clubs, sports, and doing fun things. It’s easy to lose sight of your own health with so many things going on, but if you ended up becoming sick, everything would be put on hold. It’s better to take care of yourself, so that you can continue to move forward in all the things you do. The following links will give you hints on various topics of health, including physical health, sexual health, personal safety, and mental well-being. This is by no means an exhaustive list on various ways to maintain your health, but if you’re able to follow these basic guidelines, you’ll feel better for it. For more health advice, check out the links below! Cardio is especially important, as it eases stress and increases your energy to get more done. Plus, it’s great for your heart, and just about every other part of your body. Although the standard recommendation is to do 30 minutes of cardio five times a week, even just 20 minutes of exercise three times a week can yield great health benefits. It’s also instrumental in keeping the fabled freshmen-fifteen at bay! Make sure to stretch after each exercise session—it prevents achy muscles, and releases stress and tension. Although for many college is a time that is well-known for late nights (for both studying and partying), too many sleepless nights can take a toll on your immune system, your mental functions, and emotional stability. Make sure that you get 6 to 8 hours of sleep per night to remain tip-top, and talk to your roommates about scenarios when your sleep schedules don’t match. For all-nighters, it might be a good idea to take a one- to two-hour nap the next day to make up the difference. Why are fruits and veggies so important? They have lots of phytonutrients, which protect from infection and disease, preventing you from getting ill. The less sick you feel, the more you can do and get done! Although physical health is important, many college students suffer from stress. Stress can come from: being bombarded with various school assignments, projects, and exams; responsibilities from clubs, organizations, and work; and from the pressures of maintaining relationships and a social life. Remember this: It’s very, very important to have time for yourself in order to remain calm and capable. It’s important to slow down. Many college students don’t realize this fact until they’ve broken down in tears (it’s happened, and is quite common). It’s important to keep up with hobbies you love, have time for relaxation, and have time to reflect on where things are at and where you want to go. Reflection is the particularly important one because it allows you to get a sense of your progress, and whether you’re living a life that is consistent with your values. Write in a journal, or have heart-to-heart conversations with someone you trust every once in awhile. You can take various courses on topics that intrigue you, join clubs and activities that interest you, and meet diverse people from around the nation and, at times, the world. In college, your knowledge is expanded, and you are given the opportunity to better learn about the broader society that we live in. Because of these things, you will be able to see more possibilities in front of you, and you can dream bigger. The college experience is an something that people do not forget. Students participate in activities such as hanging out with friends, going to parties, taking interesting and unusual classes, and going to football games and other sports. All of the people you will meet can be hold a wealth of new knowledge and perspectives, as well as prove to be valuable sources of support and networking. According to University of North Texas, those with a bachelor’s degree or higher have the competitive advantage when interviewing for jobs. 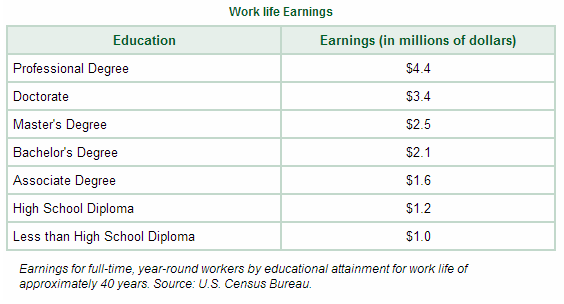 They also tend to earn 75 percent more per year than those with only a high school diploma! 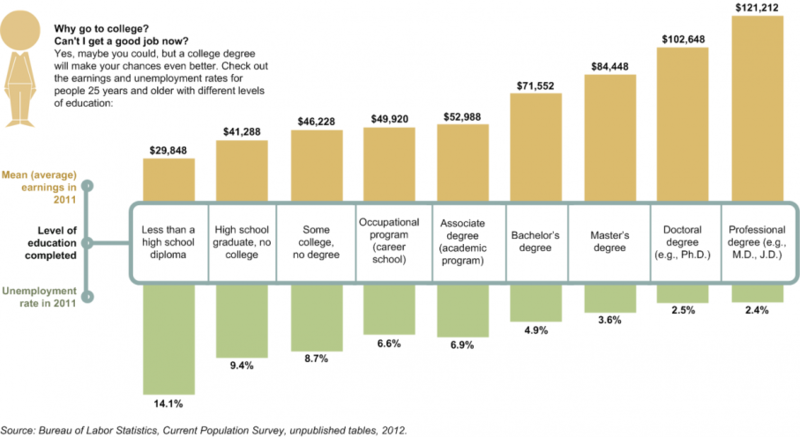 As you can see, the more education a person completes, the higher their wages and the lower their unemployment rates. Of course, situations vary and as with all charts, this one should be taken with a grain of salt. Those who enter the workforce straight out of high school do not have that luxury of time to learn about what’s out there, who they are, and what they want. Going to college will allow you that time to explore and plan out your career path. In college, everyone does their own thing. Of course students spend time with their friends, but each of them have different schedules, interests, and activities in which they are involved in. You’ll find that you are in control of the activities you spend your time on, and where your money goes. Usually, because of this independence students can learn to be good with money, people, and the handling of the professional world. According to ownyourownfuture.com, “college helps you improve your decision-making, communication, and analytical skills.” These are the skills that many businesses like to see in those they hire. With a college education, you’d have the ability to choose your career focus, your work environment, and have more autonomy in general. Plus, with higher incomes, you’d also have the ability to choose your lifestyle and what type of car you drive, home you live in, or vacations you take. This is not something that those with only a high school diploma can say they have. According to californiacolleges.edu, “education equals respect,” especially in our society. Colleges can lead to knowledge about more opportunities, and can also find internships and other advantageous resources for students. Most colleges include career centers and professors with many connections in their field. In these economic times, more college students are competing for the same jobs as those with only their high school diplomas, with distinct advantages. College students are more likely to have done internships, and their graduation and degree itself proves that they have the ability to learn new things and cope with challenging situations. Surviving, and graduating, from college is no small task. In fact, it requires a lot of self-discipline and hard work. The achievement of graduating brings with it a sense of confidence in your own abilities and possibilities, pride that you earned it, and respect from those around you. Furthermore, the knowledge and experiences that you received are things that can never be taken away from you. Many of those things are unique to college. According to schev.edu, research indicates that college graduates: live longer, have better access to quality healthcare, are more economically stable, have more disposable income, have more time for leisure, vote more, are more involved in their communities, live in more affluent neighborhoods that have better access to quality schools and healthcare, achieve higher skill levels, and their children tend to grow up healthier, perform better in school, and are more likely to attend college. You’re going to graduate from college. You’re not sure what to do. What comes next? A job? Grad School? Traveling? Follow this link from Goucher College’s website explaining what you can do with your Gap Year.